Devadas is a kirtaniya, composer and songwriter hailing from Brooklyn, New York who began singing as a teenager, performing on street corners in his hometown of Portland , Maine . 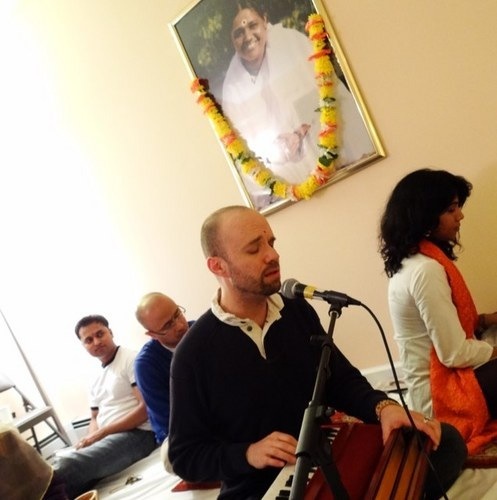 After moving to New York City, he had the good fortune to meet his Guru, Mata Amritanandamayi Devi (Amma), and under Her inspiration has been leading kirtans at satsangs, yoga studios, meditation centers and temples all over New York , the U.S. and India. He’s released “Bhajans”, an album of traditional chants as well as three albums of original devotional compositions, “Ocean – Songs for Amma”, “Shine Shine On” and “Milton’s Glen,” working with luminaries such as Krishna Das and Wah along the way. As a composer, he’s collaborated with indie rocker J Mascis to score the soundtrack to the feature documentary One Track Heart / The Story of Krishna Das and as a producer, worked with Nina Rao on her 2013 release Antarayaami – Knower of All Hearts. He’s also regularly produced sacred music events to benefit his Guru’s Embracing the World humanitarian charities, and along with fellow chant artists Gaura Vani, Jahnavi Harrison and Dave Stringer, is working with the Call and Response Foundation, a non-profit organization dedicated to bringing kirtan and sacred music to under-served groups of people. Brooklyn Mellows, an homage to the late great kirtaniya Aindra Das, is his first Mantralogy release and features a collection of musicians and singers from the vibrant New York City kirtan scene and beyond, including Anjula Saraswati Prasad, Terrence Pompey, Nina Rao, Mark Gorman, Genevieve Walker and others.